..I think I'm going to get a lot of mixed reactions on this one seeing how Alfred is relatively new, but I still believe that he deserves a spot on this list just because he's that good. Alfred finally got off his horse and got serious as his Limit Break gives him his old effect where he gains 2,000 power for each Liberator comrade on his field, but there's a key difference here: THIS Alfred CAN BE BOOSTED!!! Meaning that if he's boosted by Future Liberator, Llew, then Alfred can potentially be 31,000 every turn he attacks, and that's a pretty fearful number in itself and nearly impossible to guard later game without a Sentinel. But wait, there's more! Alfred also retains his Superior Call ability but is now used differently. 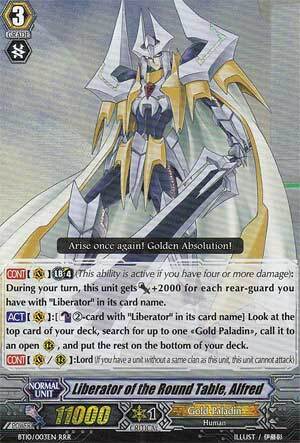 At a cost of 2 Especial Counterblast, Alfred can Superior Call the top card of the deck as long as it's a Gold Paladin, which is going to be anything in the deck in this case! This can easily backfire, however, seeing how you might flip over a Trigger that you don't want to call and also the fact that you need to Counterblast 2 Liberator cards, which makes the deck more strict as it makes you use more Legion-based cards, which isn't THAT bad in itself. In short, I personally believe that Alfred is able to bring a very imposing presence in the upcoming tournament format and is well deserving of being in the Top 10. Next Time: #5 is going to be the only unit on the countdown that is 10,000 power...but soooooo worth it! ...and DON'T be a Sackboy! !